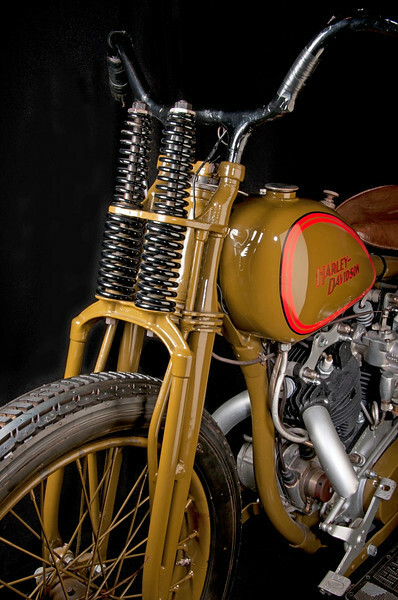 The Deeley Motorcycle Exhibition in Vancouver, B.C. has rotated its collection on the theme of the history of American motorcycling. Of course there's a predominance of the famous Harley-Davidson brand, but plenty of historic Indians too. Then there are the less well-known Excelsior, Henderson and Pierce. In addition, there are evolutionary deadends, like the attempts at steam-powered bikes. A wonderful collection and beautifully displayed. The Deeley folks welcomed me back for another photo expedition in April 2011. I shot in color with a digital camera and B&W with a medium format film camera. They're posted here as color and B&W pairs. Incidently, just after this shoot I found that Kodak has stopped production of the B&W film that I used here. In fact, the rolls that I used were right at their expiration date. Little did I know how "expired" they were. At least my experience with the beloved TriX 320 ended on the most positive note. H-D only built 30 of these, one of which Trev Deeley secured. Note the exhaust system on this alcohol-burning, single speed monster.